Scanner Radio Deluxe allows you to listen to all of the scanners hosted by Broadcastify.com as well as those hosted by Wunderground.com, RailroadRadio.net, and LiveFireFeeds.com. 5-0 Radio allows your iPhone or iPod touch to listen to all streams hosted on RadioReference.com in the background. Other features include a built-in web browser that detects .m3u and .pls links and integrates them into the app, the ability to add new feeds from anywhere, localized police codes specific to certain cities, customizable and downloadable skins, and a map that detects the location of the feed. Action Scanner delivers the entire RadioReference.com feed catalog to your iPhone or iPod touch. With our advanced technology you can scan through multiple feeds at the same time, just like you would with a real scanner. Store your favorites in banks for easy access, and adjust volume and squelch individually for each feed. Please note that the free version of Action Scanner only offers about half of the RadioReference library, and that we reserve the right to drop or change feeds at any time. Emergency Radio is the original, award-winning police scanner app offering the most extensive database of live police, fire, EMS, railroad, air traffic, NOAA weather, coast guard, HAM radio, and other frequencies. Both paid and free versions are available for iOS. Police Radio allows you to listen to all the live audio feeds hosted by RadioReference.com using your iPhone, iPod touch and the soon to be released iPad. In addition Police Radio also has the ability to play the selected feed in the background allowing you listen and check your email all at the same time. Other features include the ability to add & edit new feeds from a wide variety of online sources, ability to save your favorite feeds freeing you from constantly searching to get to the ones you like, police codes are included for you to follow the action and last but not least the ability to customize your view. 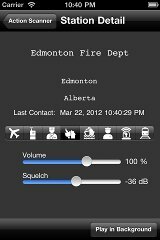 Police Scanner was the first interactive police scanner for the iPhone and iPod Touch. The app allows users to alert others about emergency broadcast streams as they happen using text messages. The text messages appear on a small ticker in the app, allowing users to tune in to the stream being discussed. In addition to allowing users to share information, Police Scanner allows users to record snippets of a stream and replay it later. The length of snippets recorded is limited only by the memory of the iPhone or other device. 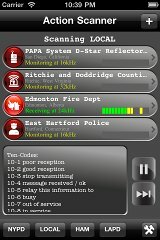 Police Scanner allows anyone with an iPhone or iPod touch to listen to all streams hosted on RadioReference.com. Police Scanner's adaptive technology allows updates to data streams to post "live" within a few hours of changes made. Because emergency data streams can change so quickly, Police Scanner is able to provide the updated information to its customers. Other features include the ability to save favorite streams, to locate streams with a map, and to answer calls and email while a stream is running. 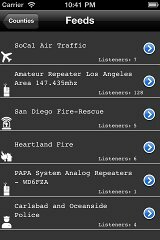 With over 2300 national and international EMS streams, Police Scanner offers the largest selection of police, fire, and emergency services streams available for the iPhone in one application. Users can locate and listen to police dispatch frequencies worldwide. Police Scanner is the only iPhone emergency scanner application to provide streams from nine countries. New streams are added daily. Police Scanner runs on wireless LANs, the 3G network, or on the Edge network, and is compatible both 2.x and 3.0 devices. Listen to over 40,000 radio stations anywhere in the world and search stations using a powerful new search engine! Radio includes the free SHOUTcast™ Radio Directory, one of the largest directories of professionally and community programmed online radio stations in the world and all your favorite iTunes stations and all Icecast stations in MP3 format. With Twitter and Facebook support you can tell your friends what radio station you're listening to, "live", without stopping your audio to invoke an external Twitter or Facebook client! Supports MP3 and AAC stream formats and PLS, M3U and XSPF playlists. Additionally Radio includes NOAA Weather Radio All Hazards streams from the National Weather Service, thousands of emergency scanner streams from RadioReference, over 2,000 European stations and stations from Australia and New Zealand, over 320 Public Radio stations, over 100 Canadian stations, plus a database of National, Local, Canadian and International channels. The latest version includes background Play, background browsing of station web site and background e-mail of station links. You can pick from your favorites or recently played scanner stations. You can share with your friends the iTunes and Radio links to a station stream using your iPhone or iPod Touch Mail application. And you can post your favorite links directly to Twitter or Facebook, while playing your stream. The only 16 Channel Scanner Radio designed specifically for the iPad!